Nowadays having a job is very important, if you wish to live a comfortable life. Almost everyone dreams of having a successful career but often due to various unavoidable circumstances people find themselves unemployed. Everyone in the business world will tell you that, today, money speaks louder than any words or actions. People without money are very helpless and dissatisfied. Believe it or not unemployment is something which can really affect a person’s mental frame of mind. 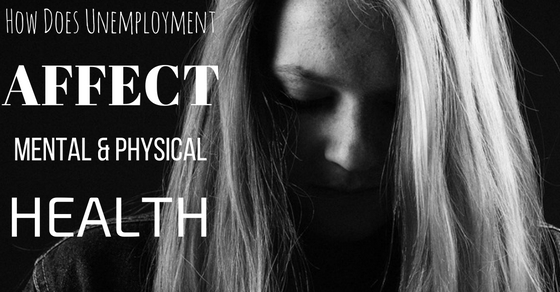 Given here are some of the main ways in which unemployment effects mental health. Of all the mental health issues which a person who is employed goes through, sadness is something which is most common. Unemployment is something which is certainly not an easy thing to deal with. If you are someone who is unemployed and find that nothing brings you joy, then maybe rather than sitting at home all day, you ought to go out and meet new people. Interacting with others, especially the less fortunate is sure to make you count your blessings and understand that all is not lost in life. No matter how bad things seem for you, think about people like these who have nothing to look forward to at all. Interacting with such people will surely give you a new take on life. Depression is something which is often referred to as the silent killer. It is very tough to deal with and sadly, it even leads people to harm themselves physically. Depression is a mental illness which may come as a result of unemployment. So if you can tell, that you being unemployed is slowly making you depressed then you should seek medical help as soon as possible so that the issue does not become too severe. Speaking to a psychiatrist will really help you to feel better about yourself and deal with being unemployed. There is no need to try and solve the problem on your own as it might prove to be an impossible task. Speaking to a professional is something that can help you in innumerable ways. There are many people who take their jobs very seriously. It is their dream to make it big on the professional front and that is why when they find themselves to be unemployed they are not sure how to deal with it. Unemployment is something which affects various people in various ways, yet most commonly is that it makes you unsure of yourself. In the business world people have to make quick decisions on the go, but once the person is unemployed he simply cannot take any decision quickly because he is unsure of himself. We all are aware of the fact that unemployment is tough to deal with, but it is an unavoidable part of life. One of the worst parts about being unemployed is that it makes very irritable. As long as you are unemployed you have plenty of things to deal with, however the moment you find yourself without anything to do, your mind is bound to become rather irritable with even the smallest of things. You might find that you are unable to deal with even small sources of irritation and you might even lose your temper with family members and friends. It might be tough to be around you but the people who know your unsettled condition are sure to understand your point of view and trouble. When you are unemployed no matter how much you try your best to be confident and sure of yourself and your ability, you are bound to mentally go through a bit of jealousy when you see others around you going ahead in their career and get one promotion after the next. Jealousy is something that has the potential to ruin a lot of friendships. No matter how jealous you are feeling of your friends or former colleagues, you should try your level best to keep it to yourself so that others do not think that you are a bad person. This is just a phase in passing; you should not let it, eat you up from within. Self doubt in the course of being unemployed is something which is natural. No matter how mentally strong you are as a person, you are bound to feel this feeling of inferiority as opposed to others. You might constantly wonder, what do others have that you are lacking in terms of skill and ability. At such a time there are many people who might turn against you, but you need to keep it together. There are many unemployed people who come together and make support groups so if you are very confused about what to do, you can join a support group and learn to deal with the mental issues which you are going through. While working in a company you are bound to be involved in a great deal of mental activity. Yet the moment you are unemployed you will find that you have less and less mental activity to deal with. This might cause you to become a little less mentally attentive and active. So at such a time it is mandatory that you do not become too lazy and keep your mind busy by doing things like puzzles, cross world games or even mental mathematics. This might sound funny, yet it is something that is bound to help you in the long run, especially if you are unable to find a job for a considerable period of time. When you manage to get a job, not only are you proud of yourself but along with you there are several other family members who are equally pleased that you have managed to get a job. So at such a time it is quite likely that in your mind you might feel that you are letting your loved ones down. To some extent you might be, yet you must keep the faith and hope that something better will come along. You must continue to try your best to get a job. If you give up hope and let go of yourself, you will never be able to get back on the horse and pick up from where you left off. Feeling alone and isolated is a part and parcel of being unemployed. When you are unemployed, mentally you are bound to feel like there is no one on your side and the world is against you. Rather than letting such things affect you, try your level best to surround yourself with positive people so that at no point in time are you feeling like there is no one to stand by you and support you in your time of need. All you need to do is try and be as informed as you can. The moment you see a job opening you should apply immediately. At the time of unemployment you are bound to feel a little useless and worthless. You might think that all the plans and dreams that you had for yourself are accounting to nothing. Irrespective of how you are feeling or how your mental anxiety is taking a toll on, you should try your best to be positive and use this time of unemployment as a period of relaxation so that your mind can relax and unwind. When you are busy with your job it is unlikely that you will get the time to go on vacation or on a trip, this is the time for you to unwind and find yourself. Getting to know yourself better is bound to make you very happy. Unemployment is accompanied by the problem of feeling restless. This restlessness is not merely physical but it is also rather psychological. You might be restless owing to the fact that you know you aren’t getting any younger or that you are remaining unemployed for longer than you anticipated. To avoid feeling like this, you should try your best to be calm and cool. If possible do join some yoga classes or some kind of meditation on a daily basis so that your mental health does not deteriorate at a rapid rate. There are plenty of videos available online which are sure to help you. Once your mind is unsettled, it is very hard to recover. As mentioned above, sadness and depression is most often a part and parcel of being unemployed. But along with that there often creeps in a feeling of desperation. Desperation is a mental state that comes when you are feeling that you have no way out. Your mind simply cannot come to terms with the fact that things have turned out this way for you. Many people become desperate when they find that their anxieties and problems are increasing on a daily basis owing to the fact that they are unemployed and their finances are becoming less and less. After irritation there comes a feeling of anger. You might not merely be angry at yourself for making wrong decisions in life, but you are sure to feel angry with the world at large. You might constantly be wondering why is the universe against you? Yet as much as you might feel that the odds are always against you, you must try your level best to understand that if you are patient, things will fall into place. In addition to that, rather than trying to make fate put things right for you, you should stand on your own feet and really start the job hunt in full force. Different people have different ways of dealing with stressful situations. Some people are mentally rather strong however on the other end of the spectrum there are those who are not very strong mentally. Cynicism is a frame of mind which especially affects those who think that life has played a cruel joke on them. Unemployment for a prolong period of time is likely to make your approach to life rather cynical as well. Becoming cynical is a very dangerous thing indeed, because there is no turning back from it. As a result of being unemployed, there are many people who turn to drinking or smoking in order to make themselves feel better and temporarily forget their worries. One of the worst downsides of being unemployed is that, on addition to making the person feel tense and anxious it also makes a person feel rather pessimistic and negative. His entire outlook on life becomes pessimistic or bitter and he refuses to see the brighter things which life has to offer. A person who is unemployed is bound to be going through many different feelings simultaneously. These feelings are sure to affect the person’s mental health. Given above are some of the chief ways in which unemployment affects a person’s mental health. So if you are a person who is unemployed do try to cut yourself a bit of slack. Just explore your options and you are bound to figure something out for yourself. In addition to this, if you know of someone who is unemployed, do try and be there for the person in their time of need so that they do not feel alone and isolated. Next articleWhy Business Owners (Entrepreneurs) Should Learn to Code?